glad he is awake finally. Good news. If he attacks his rehab as he did with the race tracks...he should be back on his feet soon hopefully. wow, that's a fighting guy there. hope he has a good continued recovery. Michael Schumacher is no longer in a coma and has left the hospital in Grenoble where he was being treated following a skiing accident last December. Schumacher suffered severe head injuries while on a skiing holiday in the French Alps and has been in hospital for several months. At the end of January doctors started to bring him out of a medically-induced coma, but further information has been limited to protect his privacy. On Monday a statement from his manager Sabine Kehm confirmed he is now out of a coma and continuing his rehabilitation at a different location. "Michael has left the CHU Grenoble to continue his long phase of rehabilitation," Kehm's statement read. "He is not in a coma anymore. His family would like to explicitly thank all his treating doctors, nurses and therapists in Grenoble as well as the first aiders at the place of the accident, who did an excellent job in those first months. "The family also wishes to thank all the people who have sent Michael all the many good wishes to Michael. We are sure it helped him. For the future we ask for understanding that his further rehabilitation will take place away from the public eye." Last edited by AZuser; 06-16-2014 at 10:48 AM. In a letter to fans, Michael Schumacher's wife Corinna thanked everyone for their support during the dark days following the Formula One legend’s tragic skiing accident last December and the subsequent months that he lay in a coma. The letter was published in the official program for this weekend’s 2014 Formula One German Grand Prix on behalf of Schumacher's family. "The German Grand Prix gives me the perfect opportunity to cordially thank you all for the good wishes and positive energies you keep sending to Michael," read a translation of the original letter, which was in German. "I have to say your sympathies blew us all away. Good to know that together we made it through the hardest time. "Now we are facing a phase which will presumably take a long time. We trust that—as for so many years in F1—time will be Michael's ally in the fight." Schumacher was treated at Grenoble University Hospital Center in France following his skiing accident, which left him with severe head injuries. Upon waking from an induced coma last month, the 45-year-old was transported to Lausanne university hospital near his home in Switzerland. Schumacher competed in F1 from 1991 through 2006 and then again from 2010 through 2012. 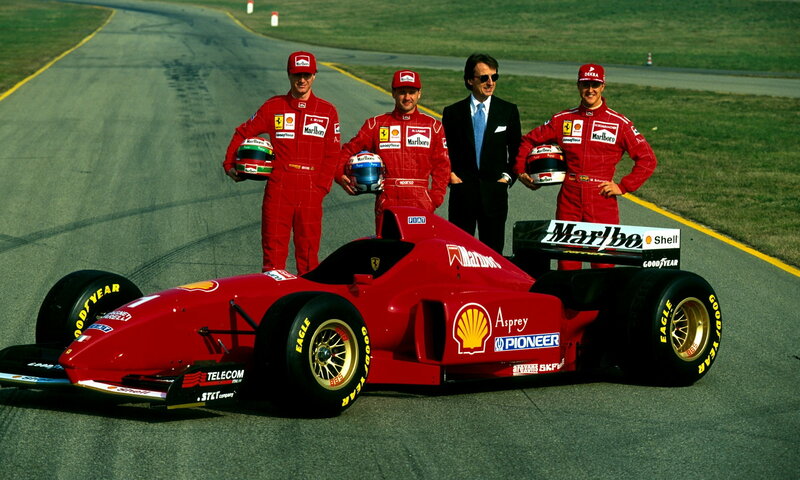 During this time he achieved seven world championships, making him the sport’s most successful driver. Formula One legend Michael Schumacher has left the Swiss hospital he has been receiving treatment in for head injuries caused by a tragic skiing accident last December, to return to his home where he will continue his recovery. The information was confirmed by his manager Sabine Kehm in a statement made earlier today. "Henceforth, Michael's rehabilitation will take place at his home,” Kehm’s statement read. “Considering the severe injuries he suffered, progress has been made in the past weeks and months." Schumacher, 45, fell and hit his head on a rock in a skiing accident at the Meribel ski resort in the French Alps last December. Despite wearing a helmet, the seven-time Formula One world championship sustained serious head injuries and needed to immediately be put into a coma so that doctors could safely remove blood clots from his brain. He was initially being treated at Grenoble University Hospital Center in France and upon emerging from his coma last June was transferred to Lausanne University Hospital in Switzerland. He has now returned to his home in Gland, on the shores of Switzerland’s Lake Geneva 254 days after his accident. His family and manager have thanked the doctors "for their thorough and competent work" and have asked that their privacy be respected. Good to hear he's headed in the right direction. Precious little is known about Schumacher's health condition, but Todt has reportedly now delivered an upbeat report to the Belgian broadcaster RTL. "We may assume that Schumacher can live a relatively normal life within a short period of time," said the FIA president. "What we can say is that he will probably never again drive a formula one car." "He fights. His condition improves, which is very important," said Todt, "as is the fact that he is now home with his family." Wow, that is really good news. If Schumi can't drive anymore, my place can be a good home for his un-needed car collection. Michael Schumacher still has "a long and hard road ahead of him," the F1 legend's friend Jean Todt said this week. On Tuesday, we reported that the FIA president had told the Belgian broadcaster RTL after visiting Schumacher at home that the great German "can live a relatively normal life within a short period of time". The quote was translated from print reports that appeared on Monday at the specialist Dutch website formule1.nl, and the Dutch-language Belgian newspaper HLN. Subsequent investigations have revealed that Todt's comments were in fact made to French radio RTL, in which the 68-year-old did sound optimistic about the future of his former Ferrari colleague. However, it was actually the reporter who had asked Todt if Schumacher will one day live a 'normal life' again, to which the former Ferrari boss answered: "One can only hope." "We can say he will probably not be able to drive in formula one again. "He has made progress in recent weeks and months, but there is still a long and hard road ahead of him. "He needs time and rest. He fights and one can hope that things will improve quickly." When pressed for details about Schumacher's current condition, including whether the former Ferrari and Mercedes driver can move and speak, Todt insisted: "I do not want to say because it is a very personal matter. "What is important is that he is alive and his family is around him." Looks like the original quote was mis-translated. Hopefully, Schumacher continues to improve. Let's hope that is indeed the case. ^^ Great news. Former F1 driver Philippe Streiff, who is a quadriplegic after a 1989 crash, told French radio that his friend is "getting better". But he added: "Everything is relative. It's very difficult. He can't speak. Like me, he is in a wheelchair (and) paralysed. "He has memory problems and speech problems," added Streiff. that's awful-I knew it was bad but didn't know he was that bad. Very sad. Just an absolute shame. Not to slam the post but it seems to me this is more non-news than credible news no? I saw that, always hoping to learn more but he's not saying much either really. If he is not in coma, does it mean he is awake now ? he's been out of the coma over a year but I don't know (who does?) what level of consciousness he truly has. Schu is reportedly near death. Montezemolo has reported his health has deteriorated and my brother has heard from some F1 insiders the same thing. Maybe it is a blessing in disguise but still . . .
"But to draw any conclusions from what’s been said today would be pointless, just as it has been ever since that fateful day in December 2013, when he took an off piste route at Meribel." Yes, I'm confused and mostly, worried. Don't know why Luca is speaking to the press about this if he knows the family wants to keep news out of the press. You know whenever someone who suffers TBI like this, in a coma, then comes out of coma but then you never hear them from the news again...usually very bad sign. Means things are not going well and family is wanting to keep as much privacy as possible. Working in the medical field I've seen people who have had TBI and become completely different people afterwards. Sometimes can be very tragic with a loss in impulse/emotion control and depending on how bad that is...associated management strategies to keep themselves and family members safe. Obviously I don't know the situation with him but just something that can happen. Very very sad news all around. All the news stories seem very...vague. They report Luca saying that he has news & it is not good, and that's it. Then, speculation in the articles. Still hoping Schumi reaches the end of this dark road. Yeah, and I don't recall Schumacher and Luca being friendly after his retirement from Ferrari. From what's written, Schumacher has a small but close group of friends including Mick Doohan (Schumacher named his son after him), Jean Todt, Ross Brawn. Even his old manager Willi Weber is not allowed to see him. +1, my dad had a bleeding stroke (~dozen years ago) and was in the neural intensive care unit at Johns Hopkins. I remember how many others were there for a variety of accidents. The most important thing I remember from the doctors was time is not your friend in most brain injury cases. Fortunately my father was making progress within hours of his stroke and he fully recovered. Many do not. Yeah, hoping the same but little news sorta assumes bad news after all these years. Last edited by Legend2TL; 02-15-2016 at 09:58 AM.